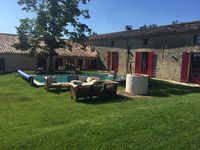 Property 7: Near Saint Emilion, Fantastic terrace. Private pool, Big Family house. Have rented numerous vacation properties and this was by far the best to date. The house is absolutely beautiful, impeccably clean, with every modern convenience you would want and all details taken care of. We were 9 adults and had more than ample room to gather in the evening and cook meals. We particularly enjoyed the private bedrooms with very comfortable beds and ensuite bathrooms. Both the owner and housekeeper were a real pleasure to deal with and went out of their way to ensure we were well taken care of. Excellent amount of information provided both before and during our stay - on the house, things to do and surrounding areas - including grocery stores, restaurants, wineries, etc. A simply wonderful experience in every aspect and highly recommend this property. 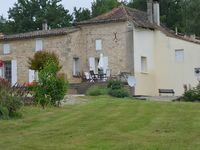 A lovely place to stay, really good accommodation with beautiful outside space. Really good hosts. The house is lovely, great accommodation with everything you need.